Thank you to Norm Boetger, organizer of the 'Stormin' Norman' golf tournament held in honor of his father, Norm Sr., for his donation of proceeds from the tournament! Boetger raised over $6,000 for the Barber National Institute! 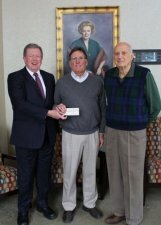 PHOTO: John Barber (left) recieves check from Norm Boetger (middle) with Pete Russo (right).